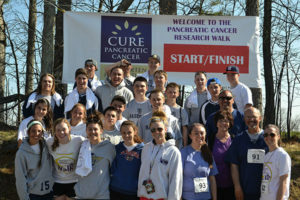 Westborough- On Sunday, April 28, the Westborough Tennis & Swim Club by Boston Sports Club will hold its 10th annual 5K Walk/Run and 10K Run for Pancreatic Cancer Research to benefit the Lustgarten Foundation. This event has had such a positive response from the community and continues to grow while raising awareness about this disease and raising funds for research. Hundreds of participants sign up each year, whether they are walking, running or volunteering. Children are also welcome to join the free Kids’ Fun Run and enjoy a craft table. While the 10K is for runners only, the 5K is walker and stroller friendly. There will be two different routes depending on which distance each participant chooses. Pets are not permitted. Maria Rydelek, Angela Callery and Cheryl Avola, have been working tirelessly to prepare for this year’s event and they are grateful for the support of so many local businesses and organizations like Dunkin Donuts, Toll Brothers, Bruins, Boston hotels, Arturo’s, Wegmans, Spatique, H2O, Stop and Shop, Roche Brothers and so many more. Northstar Ice sports and Emseal allow for parking, at least 100 National Honor Society volunteers from Westborough High School help and the school’s a cappella group will sing the National Anthem to start the race. “We as volunteers with a dedication to finding a cure for this disease are so grateful for past and present support of local businesses, volunteers and participants. Our hope with this event is to continue to generate much needed research funds, heighten public awareness of diagnosis, treatment and prevention and one day find a cure,” said Callery. According to Callery, MIT and the Dana-Farber Cancer Institute target pancreatic cancer with two dedicated laboratories, a $10 million investment funded by the Lustgarten Foundation. Individual racers and teams may participate in the event. Teams will be asked to donate a raffle basket with the proceeds donated to the Lustgarten Foundation. Check-in begins at 8 a.m. The Kids’ Fun Run begins at 9 a.m. and the 10K and 5K Walk/Run begins at 9:30 a.m.
To register for the race, go to lustgartenwalkwestborough.org. 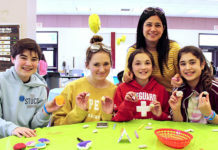 To volunteer, call Lisa Crowley, events coordinator, at 866-789-1000 or go to Events.lustgarten.org2019westborough.volunteer.